AF9A IN Great signal on 40, 9+20. Your signal on 20M was down in the noise on your east antenna, didn’t hear you at all on the west. K6YAZ CA Nothing heard at all on 17 meters. I am using a dipole, oriented in favor of your QTH. Very weak on 20; using 3 element beam. Best guess is 14.055, 242.2, but too weak with QSB to really pin it down. KD2BD NJ Very weak signals were copied using a 'solid-stated' Hammarlund HQ-140-X receiver in AM mode. An audio oscillator tuned with a multi-turn pot was compared to received audio on aTektronix 465 scope until a somewhat stable Lissajous pattern was generated. The audio generator's frequency was measured using a homebrew frequency counter using WWVB as a timebase. Almost continuous Doppler shifting was observed. N5PWG TX No signal heard on 17 and 20 meters, but I had the 80 meter antenna on, oops. Good WC signal, even with the 80 meter antenna. VE2AZX QC 80m sig was 57,40m was 59+,No copy on 20m and 17m. Thanks for running the FMTs. W0PHD MN did not know about the 17 meter I was going by earlier release. did not Hear anything of you on 20 meters. found the A" Signal on 3555801.825 but never heard the B signal so no difference to report"
W1PW AZ Sorry I missed your 18 MHz and 14 Mhz tests. The remaining test results are included, but the WC signal was so weak as to be nearly imaginary. 40 Meter skip from CA to AZ must have been nonexistent at that particular time. W3JW VA Conditions were average with moderate to low QRN. Doppler effects were moderate but quite noticeable (both on the test signals and WWV). The cleanest display of the evening was for the 8o meter two signal test, using the AM mode. W5UFZ AZ Thanks again for running the FMT. Lots of fun. WB9FIP WI The effect of selective fading was easily seen on the two tones. Thanks for combining propagation study with the FMT. 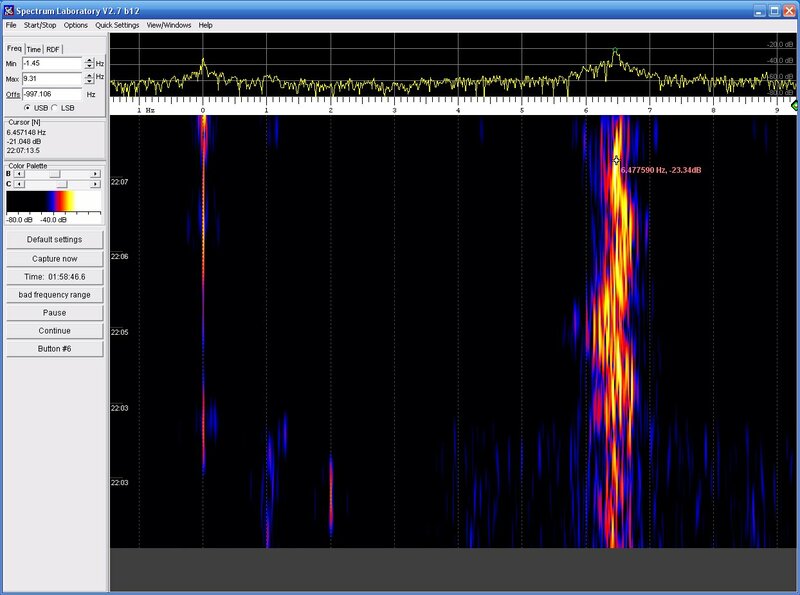 See a screen shot of W6OQI's signal as copied by K5CM. The reference marker (7065368 Hz) is at zero on the ruler. Hear a short clip of W60QI. Jacques, VE2AZX, put together some very interesting graphs of my 80 meter difference run and my 40 meter run. His perfect reading of the difference frequency was done with AM mode and Spectrum Lab. Here is a screen capture generated by Jacques wave file, but I increased the FFT/Decimate to 32K/64. Almost the entire file is required to generate the first FFT. Notice the straight line. (hit f11 for best view). 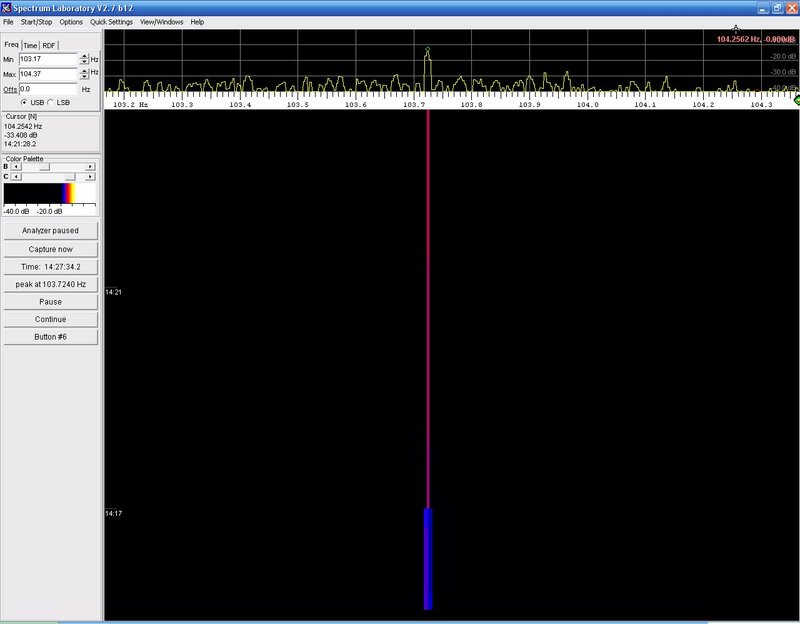 John, WA1ABI, shows that almost all Doppler is canceled by measuring the difference of the two 80 meter signals in AM mode. This was John's first FMT with the group. He had a great start with a sub 10 mHz reading of the difference frequency. No one was able to copy the 17 meter signal. Then again, were at the bottom of the sunspot cycle and still in summer time conditions so this is not surprising. It was interesting to see how important soundcard calibration becomes when measuring the difference frequency. 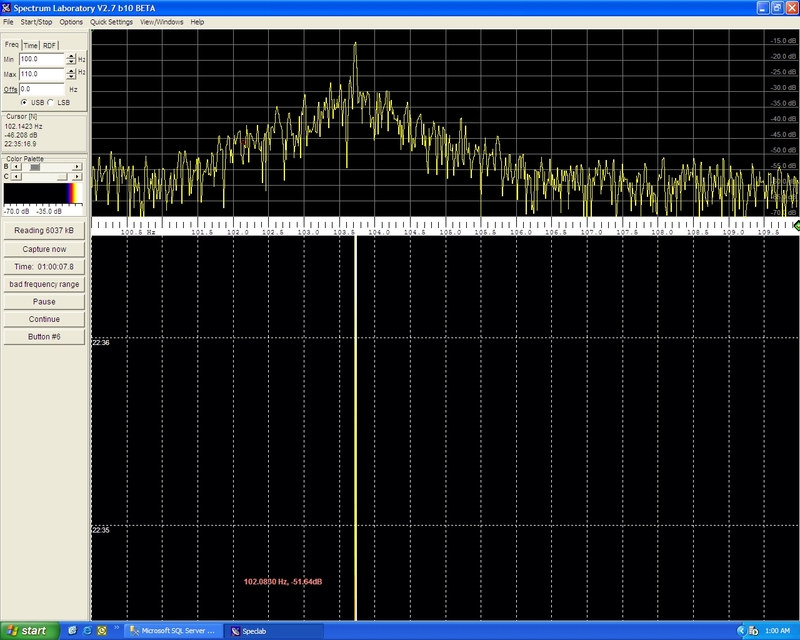 Being off only 1 mHz (.001 Hz) causes a 10 part per million error at the audio frequency. When most of the Doppler is removed from the equation, calibration becomes paramount. Stations copying K5CM 20 meter run to .1Hz or better. Thanks to all that participated, and have a great Labor day weekend.